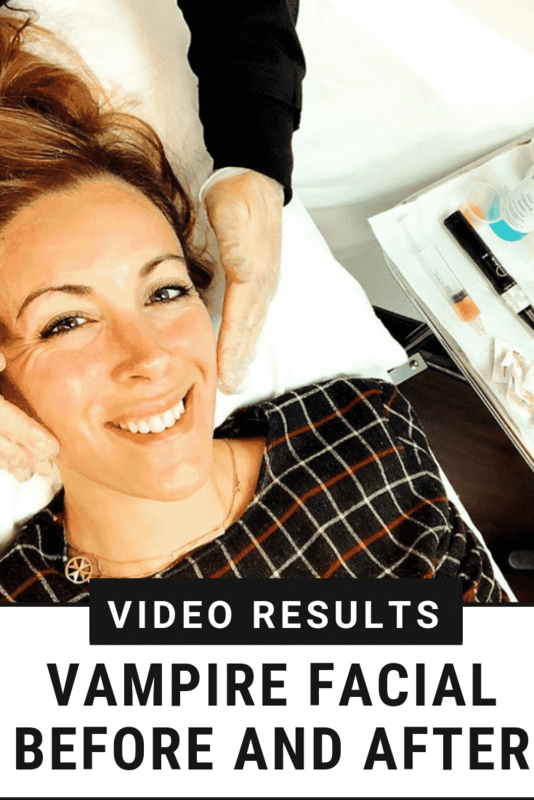 I am so excited to write this post about the Vampire Facial – aka micro needling with PRP – because it is something that I’ve wanted to try out for a very long time. As you know, I am over 40 years old and I recognize that I am at the point of my life where I need to be strategic about my skincare. Strategic skincare! That’s right!! I can’t just slop on some random moisturizer and hope that my fine lines take care of themselves. I need to research beauty care routines, facials, procedures… and figure out if they are worth my time and money. The Vampire Facial has been on my short list for quite some time. That’s why I headed to Rafal Dermatology to finally give my skin the care that it’s been begging for. What Does Microneedling And PRP Help? According to the nurse that administered my Vampire Facial, microneeding with PRP specifically focuses on leveling pigmentation, works on brightening up one’s skin, and creates an overall healthier look for the patient. It also helps with fine lines and wrinkles and actually helps build collagen. So, there’s a LOT going on with the Vampire Facial. I want to warn you, there are needles in this video. So, if you are squeamish, be warned. This video also shows great before and after results. It’s long because I wanted to give you the FULL picture. I just LOVED my time at Rafal Dermatology. The team gifted me this facial in exchange for this review. Everyone was so knowledgeable. It was important for me to understand what was happening and they were not upset when I asked my million questions. LOL! I asked Lauren – the nurse who performed the microneedling with PRP on my face at Rafal Dermatology – a few questions about the procedure. Here are her answers. I thought they were VERY informative. We stop building our collagen in our early 20s, and that’s how we start getting the looseness in our skin. We don’t have that same look that we did when we were younger. So, as soon as Vera leaves here today, she will look completely rejuvenated. It’s a great treatment. In the microneedling pen is a sterile tip that has 36 little needles. This is called the Flawless needle. It will graze across Vera’s skin, breaking through her epidermis, her top layer of skin, getting to her bottom layer, her dermis, to help spark that collagen production. How Do You Use The Plasma? We infuse her plasma, which is being drawn up now. We push that into her skin. This is actually her own plasma, her own blood. This sparks collagen production. This enables her to leave here today with glowing, beautiful skin. What Is This Term “Liquid Gold” I Keep Hearing? The liquid gold is your plasma. As soon as we take it out and it’s just going to look like liquid gold. It’s beautiful. Our patients love it, and that’s what everyone comes in for. This is all natural. We’re not infusing anything else into your skin. This is all you. Why Combine Microneedling With PRP? Right. So we’re doing it by two different modalities here. One thing you can do is you can just draw your blood out and you can let the blood and the plasma sit on top of the skin, but what we’re adding here is we’re adding an additional modality with the microneedling. Like I said, we have the 36 little needles. This helps breaks down into the dermis, which is your bottom layer of skin, and then it’s also helping push your plasma in. And what that liquid gold does is it helps naturally builds collagen. It’s going to boost the production of that collagen that you probably still have, but it dwindles. As we age, it dwindles. Why Not Just Do Botox? A lot of people like doing PRP, because … We always have Botox and fillers, right? Botox and fillers are immediate results, but Botox and fillers aren’t doing anything to help your skin. They’re just giving you those immediate results. When you get Botox, you normally see the results in about two weeks. It takes time. When you do fillers, well, that’s instant gratification. You see the results right away in fillers. Botox is very safe now, we do that here. Our hyaluronic acid fillers are also very safe. But they are not building the collagen. They are not helping turn back the time on your skin. With this treatment, you are doing that. You are actually helping your skin in a natural way and you’re not injecting anything that’s fake or artificial, or any other modulators into the skin. So, if you’re not really quite ready for Botox or fillers and you just want to do something that’s going to maybe pay off more in the long run, this is a great option. If you really want to stretch your penny, this a good treatment to really help make your money go a little further, If you do Botox and fillers and maybe you don’t want to do them as much, this is also a nice treatment to do. How Often Should You Do The Vampire Facial? Most people do about two to three treatments every year. After that, it’s really up to the patients on how they want to add this into their protocol and their regiments. The reason we like to do two to three is you really want to build up a significant amount of collagen so that your treatments pay off. I would say after each treatment, you might see a nice 5-10% difference in your skin with the collagen growth, which is pretty significant. Right now, Rafal Dermatology if having a deal on the Vampire Facial until December 20th. Normally, the microneedling with PRP combination retails for $1000. However, they are discounting the duo for $650 which is quite a BARGAIN if you ask me. The savings are substantial. Be sure to reach out for more information or for a consultation. Besides the Vampire Facial, Rafal Dermatology offers a NUMBER of services focusing on anti-aging, weight loss, hair therapy and more. Their full menu is available online. I truly enjoyed working with the staff on this review. If you watch the video, you will notice that my skin looked absolutely tight, glowing, and healthy right after the facial. I was red – but it wasn’t obnoxious by any means. I do want to note that this was the first of three stages when it comes to the Vampire Facial. With microneeding and PRP, there are three different levels of depth that they reach with the needles. I was phase 1. The second and third facials both have a bit of downtime – or so I am told. I peeled for a few days. But not when I was out and about. Only when I took a shower and gave my face a good scrubbing. I didn’t mind it one bit because I knew that it meant that my top layers of skin were coming off which meant that my new, younger, fresher layers were coming to the surface. I made it a point to start using great products immediately – ones that were jammed with anti-aging magic. The point of doing these types of facials is to get your skin to a place where they can absorb amazing product. My face is like a sponge at this point. I am feeding her everything. Will I try the next level? I will. I am curious about it all. I do love the results of the first go around. Truly I am. This is a very personal thing, but I have Hashimoto’s disease which makes me very, very, very dry skinned. So, believe me when I say that I need a good exfoliation. I have to work triple time to take care of my skin and this was just what I needed. Have you done the Vampire Facial before? What did you think of your results? Did you do all three rounds? Would love to hear what you have to say!